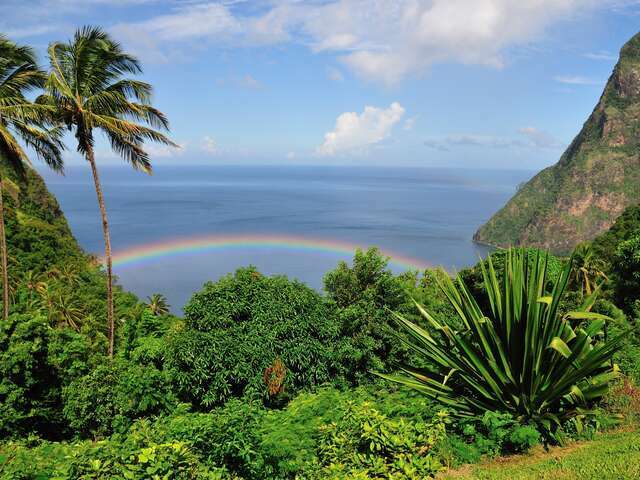 The foodie experience in St. Lucia is impossibly romantic. Here is our list of the top 5 foods to try. A gentle breeze flows through the open dining room, cooling down a hot summer night. Candle-lit lanterns bathe the wooden decor in a warm light. The subtle clinking of cutlery and hushed conversation is all that's heard in a room full of couples gazing lovingly at each other. The setting is impossibly romantic. Here, at the Coal Pot Restaurant, one of St. Lucia's most elegant spots, it's not just about atmosphere; it's also where you'll find some of the best examples of St. Lucian Creole cuisine. This distinctive blend of West Indian, African and French influences can be identified in the sweet, fresh crabmeat of the traditional "crab backs", and of course in the rich creole sauce smothering the restaurant's enormous jumbo shrimp. The waterfront location and its authentic menu has made the Coal Pot a popular choice for foodies since 1966. It's a perfect place for an elegant sit down meal and a great introduction to the many foodie experiences one can have in St. Lucia's capital, Castries. Local crabmeat sauteed with herbs and garlic butter sauce, served inside hollowed crab shells. A street food favourite! Deep fried salt fish battered with spicy seasoning. The "official" dish of St. Lucia is just as it sounds - salty cod fish and vegetables with a side of bananas, the islands leading export. Mangoes, soursop, pineapple, coconut, pomme d'amour, five finger, chenet, bananas, kiwi and more! Made from a starchy root vegetable, this unleavened bread can be easten like a sandwich with fish or combined with coconut, cherries, raisins and apple for a sweeter treat. Free Nights + Resort Credit!